Simply use kit with any bookcase to create enclosed and locked storage space. 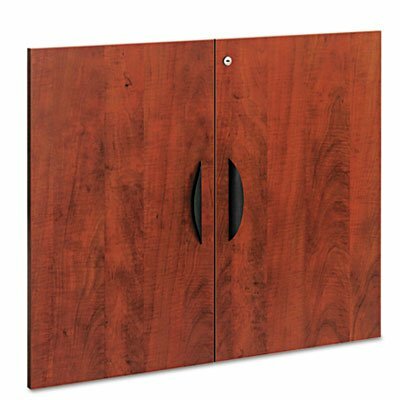 Use one door kit to enclose 30 inches and lower portion of 44 inch cabinets; two door kits to enclose 56 inch cabinet or lower and upper portions; three kits to fully enclose 82 inch cabinet. The durable woodgrain laminate is water-, scratch- and dent-resistant, featuring protective 3 mm edge banding. Lockable with two fold-over safety keys. Color: Medium Cherry; For Use With: Alera Valencia Series Bookcases; Material(s): Woodgrain Laminate; Overall Width: 31 1/4".